For industrial warehouse racking it is tough to beat cantilever racks. Almost any type of load can be stored on cantilever racks. The most common uses for cantilever rack is in the storage of pipes, the storage of wood, the storage of bar stock, and the storage of other long materials. Configured correctly cantilever rack can be perfect for almost all industrial warehouse racking applications. With their open front, ease of loading and unloading and their exceptional ability to handle long loads are core strengths. There are many forms of rack but few are as flexible as cantilever rack for industrial warehouse racking applications. 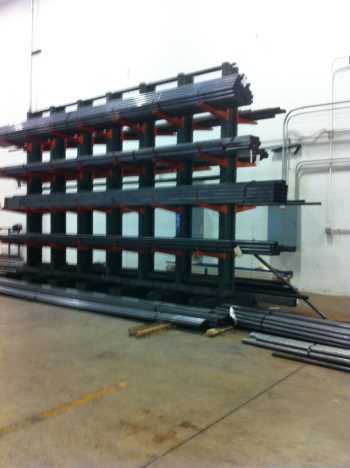 If you are looking for Cantilever Rack in Chicago, Illinois, or the Mid-West states, CSI is your logical choice. We highly recommend three cantilever rack manufacturers; West Point, Hannibal, and Steel King. All three are exceptional cantilever rack manufacturers. CSI provides cantilever racks for many industrial warehouse racking applications, but most commonly for applications with long product. IF YOU DO NOT SEE SPECIFICALLY WHAT YOU ARE LOOKING FOR, Contact us. We offer a wide variety of options, including lengths of arms, heights, style of arms for unique loads, shelves for odd shaped product, installation, and more. If it is determined that cantilever rack will not assist in achieving your objective we have many forms of pallet storage for many different objectives and environments: Selective Racks, Pushback Racks , Flow Racks, and more.